All Planhorse Trolleys are front loading and freely mobile. They are supplied in flat pack CKD format ready to assemble. Assembly instructions and hardware/parts are included. Manufactured of powdercoated tubular steel in black they complement the white clamps. Hanging Modules are of 3mm flat steel powdercoated white whilst castors are heavy duty in black. Trolleys provide lower cost per sheet filing than any other form of filing. The Trolleys are built for the rigours of construction sites yet are equally at home in architectural and design offices. Front loading the mobile trolleys eliminate the frustrations in-herent in filing drawers, Prong cabinets and drop lift trolley systems. Hanging and removing clamps from the Trolleys is quick and simple. Simply insert clamp from the font tilt the clamp then straightens to secure the clamps front stop. Reverse the procedure when removing. No annoying swing brackets or end supports to contend with. 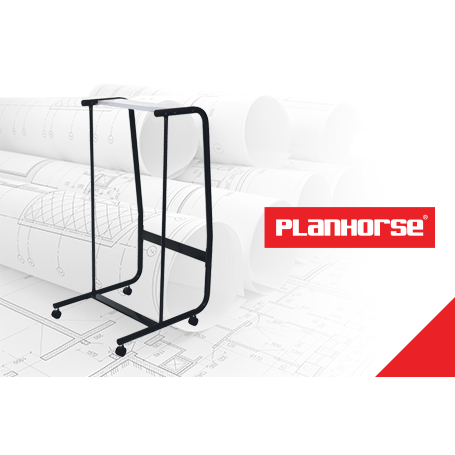 All Planhorse Plan Trolleys are front loading and freely mobile. They are supplied in flat pack CKD ..
All Plan Trolleys are front loading and freely mobile. They are supplied in flat pack CKD format rea..